When it comes to oral care, there are probably just a few people who take extra steps towards achieving optimum oral health. Yes, we brush our teeth everyday; however, it is not enough to fully clean our mouth. Flossing may be able to remove plaque build up but can we seriously do this every single day? Moreover, flossing alone cannot kill the root of the problem. Now, this is the part where mouthwash comes in the picture! When you ask a person this question, "What comes first to your mind when you hear the word mouthwash? ", the answer might probably either one of these: "It stings!" or "It contains alcohol!" They might be right, yeah? What if I tell you there is actually a mouthwash that is neither of the two? Seriously! Let me introduce to you OraCare Merrymint Mouthrinse that I got from Sample Room few weeks ago! Gets rid of bacteria that causes plaque build-up, gum disease and tooth decay. Neutralizes volatile sulfur compounds---the true source of strong mouth odors. 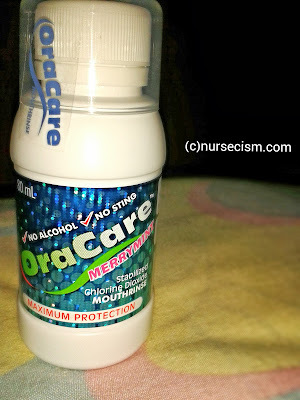 After brushing, rinse with 15ml Oracare Mouthrinse for 60 seconds. No need to dilute with water. I availed this sample because I got curious how something that has no alcohol in it can actually clean and freshen someone's mouth. So when it was delivered on our doorstep, I tried it after brushing my teeth that evening. Read on to know how it fared. OraCare Mouthrinse Merrymint is a colorless liquid---yes, it's crystal clear as water! The container is so easy to open and it comes with a measuring cup so you don't have to look for other container every time you have to gargle. It somehow smells like chlorine---which by the way, is its key ingredient. Stabilized Chlorine Dioxide is known to kill microorganisms and eliminate odors. After gargling, there is just a hint of mint flavor. This is not what you usually expect of a mouth rinse, but still acceptable. :p Their claim that it doesn't sting is true. It didn't sting even a little bit! I guess this product would be most helpful to people who frequently have mouth sores as they can enjoy having fresher and cleaner mouth without that "ouch" feeling other mouth rinse gives. In conclusion, I can say that this product really works based on experience. It might not give you that menthol or icy cool breath after using but it definitely makes your mouth clean and healthy!